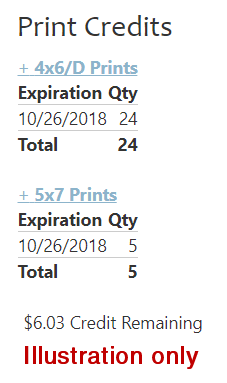 How many print credits do you have? If you have received dotphoto credits, you can find the number currently available by tapping onÂ MyAccountÂ from the drop-down menu in the upper right. Even free prints can ship free whenever you order $10 of paid merchandise. For instance, if you order 1000 prints with credits plus a paid 30×40 poster, the entire order ships free. and how do I apply them?